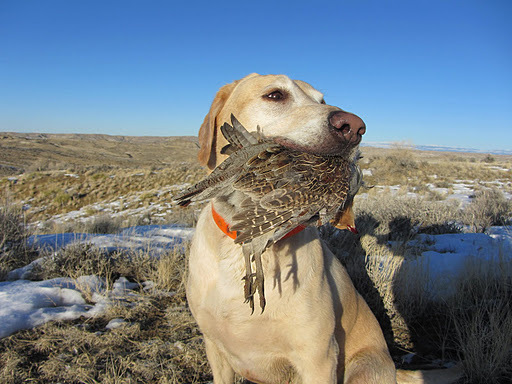 We had reached the point in our hunt where I was ready to call it a day and head back to the truck birdless when Abby did a most remarkable thing, she disappeared over a rise and then came back with her eyes wide and tail wagging. I had seen that look before and knew that she had fresh bird scent and was coming to get me before she flushed the birds. I vividly recall the first time she did that as a pup and I was amazed that (1) she knew the birds were there from such a distance and (2) that she had the wherewithal to come back for me. I hurried up to the top and then did my best to stay with her as she feverishly worked out the scent and then dove into the middle of the covey with a final mad dash. It was comical to watch as at first the birds just split and ran around her like the parting of the Red Sea only to flush when she turned around for the second pass. It may surprise some to learn that I have a Lab. 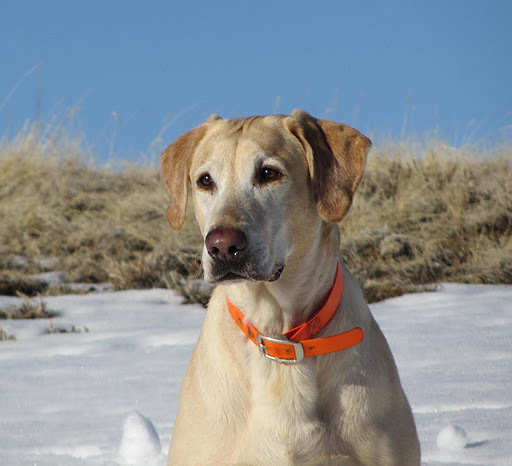 The truth is that I prefer the Zen of hunting with Pointers BUT Abby was my first dog, she and I learned how to hunt together and we hunted a lot and she became a fine bird finder. It has been said (by me) that a slack wind is the bane of all sailors and bird dogs. The way my Pointers operate is by running the edges and ridges testing for scent carried by the wind. The reason why? In a word, efficiency. A dog that hunts for body scent carried on the air can cover a vastly larger area and find more coveys than a dog that plods along with its nose to the ground. It’s a murderously effective way to hunt…..when there is wind. So what to do when you’re in the middle of great bird country and the air is as still as a teenager on Saturday morning?? You bring out the Lab. The Labrador Retriever is the Woolly Bugger of bird hunting, it may not be pretty or refined but it puts meat on the table. Abby the Labby rocks! I don't care what anyone says: A good lab is hard to beat. I have hunted with Ryan and Abby, even before he had pointers. And she is all that! What a great dog. Nice piece, Ryan. You would do very well in my English 1010 class…I can tell. My dogs can scent birds a long way off too, but they always go off and find someone who shoots better than I do.